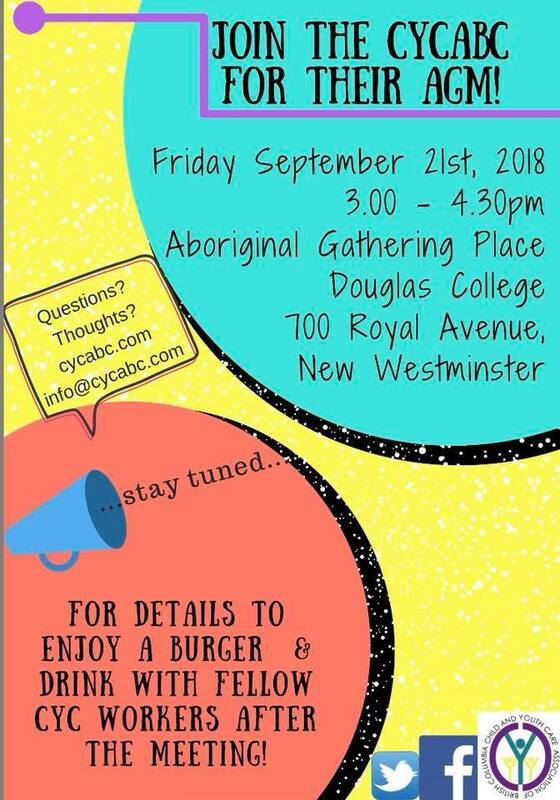 About Us > 2018 Child and Youth Care Conference > CYCABC > AGM 2018 This Friday Sep 21! We will be holding our Annual General Meeting at Douglas College in the Aboriginal Gathering Place (700 Royal Ave) from 3:00-4:30pm on Friday September 21st. We would love to have you join us for a time of exciting Association updates, Board Nominations and a report from the Board President. Please RSVP info@cycabc.com and message us about opportunities to join the 2018/19 Board of Directors (terms typically run April through March, with monthly meetings).